If you create a Barnes and Noble Education account, and the account does not have any active Yuzu eTextbooks associated to the account, you cannot get past the Profile Page to access the new Reader. If your first order was recent (past 48 hours), it is possible the order is not ready. For your first purchase, you receive two emails. A welcome to Yuzu email and an email when your book is available for viewing. If you attempt to access your eTextbook before your order is ready, you cannot get past the Profile page. If the email you registered your books with on purchase (either in your Barnes and Noble College Bookstore or online) is not the same as the email you are currently signing in with then, you may not see some or all of your books. Please contact CustomerCare so we can combine your accounts. If you have an unused Access Code from the previous Yuzu platform, you must return it to the store and purchase the title in the New Yuzu platform before you can get past the Profile. 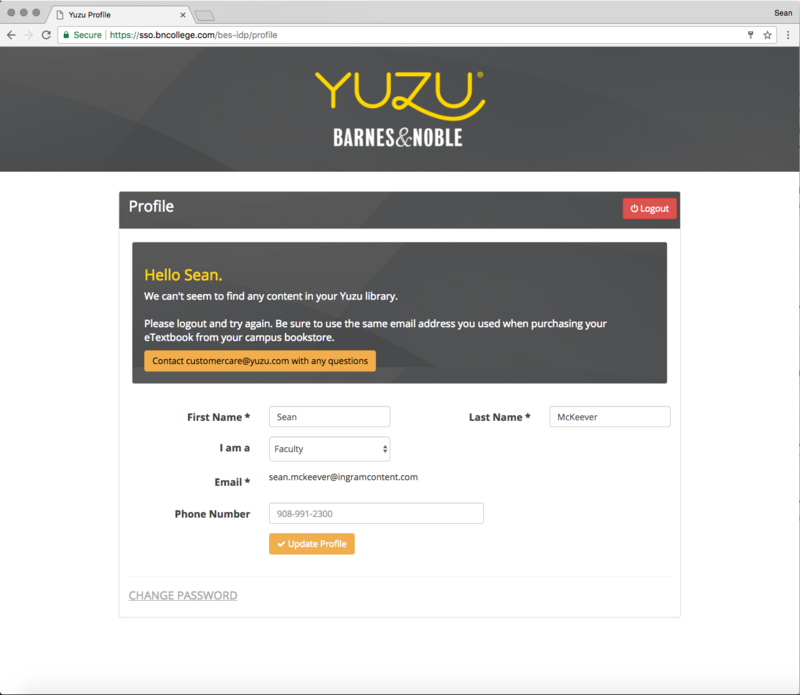 If you had books on the previous Yuzu platform and received a migration email but never clicked the link to sign in, or if you did but still cannot see your book it is possible there was an issue with the migration of your account. Please contact Yuzu Customer Care so we can assist you with this. If you have requested a refund of your book and because of the refund, you no longer have any books on your account, you cannot get past the Profile Page until you purchase additional eTextbook(s).